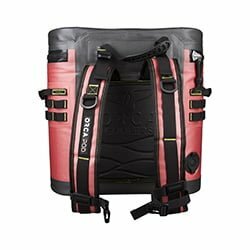 The Orca Backpack Cooler is a marvel of design and engineering from a company that we have come to recognize for producing nothing but marvels. Orca has a long-standing history of producing premium products that look cool and do the job without a fuss. Orca is actually an acronym that stands for “The Outdoor Recreation Company of America”. This company was started by outdoor enthusiasts that were just as tired as all the rest of us of buying coolers that couldn’t keep up with the demands of an active lifestyle. They built a company that solved this problem and have become industry leaders as a reward. Not far ago we did an extensive review of their hard coolers, and we weren’t disappointed. Once we heard about the Orca Pod cooler and the Orca Podster cooler, we decided we had to get our hands on them and find out if they’re worth their salt. As it turns out, we found out that these soft-sided coolers were worth their salt, ice, cans, whatever you want to call it. So, if you want a verdict before the review, you have it: we love them! But allow us to give you a detailed explanation of precisely why we love them. 18" x 11" x 18"
Okay, first, we would like to point out how unique the same of this cooler is. Of all the soft coolers we have ever reviewed, the Orca clearly stands out. It’s got a cylindrical shape that looks very impractical at first. I mean who wants to carry a small barrel on their back? But once we got to using it, we were immediately converted into believers. It’s very practical and easy to carry, whether you’re trying on the Orca Pod or the smaller Orca Podster. Both Orca backpack options are very similar in terms of construction and features. They differ mainly in size and capacity, and therefore in their possible destiny. But about that in a moment. That said, the Orca backpack cooler is very robust. Despite the fact that it is a soft-sided cooler, it is by no means ‘soft’. It was designed for long and arduous hikes or grueling times in a canoe. It is made out of a sturdy 840 Denier double TPU. This material is BPA free, approved by the FDA and completely antimicrobial, meaning you don’t have to worry about it harboring any dangerous diseases. The bag itself is also RF welded for extra durability. All Orca Backpack coolers are designed in Nashville, Tennessee and made in China. Here no expense was spared. The Orca Pod cooler and Orca Podster cooler are both well designed with great insulation to keep the warm air out and the cold air in. The insulation on the inside is 28 mm closed cell insulation made out of met polymer. 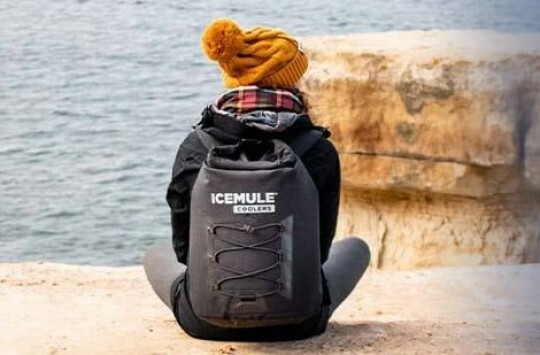 That is very good insulation, and that’s why the Orca’s backpack cooler can offer such great ice retention times. There is also EVA reinforcement all around the cooler to help with the insulation. That includes the lid, back, and base of the backpack. The ice retention simply blew us away. These babies can hold ice for about 3 days! We put the ice in and put the backpack cooler in 90-degree weather. Okay, to be honest, we didn’t just ‘put’ it in 90-degree weather. We actually went camping with it. That involved a long hike that lasted 3 hours to the top of a small mountain. We then camped out there for close to two days. The temperatures varied but they were as high as 120 degrees sometimes. At the end of the retreat, the cooler still had some ice! And this was with us often closing and opening it. That’s why we gave the cooler an ice retention rating of 5. 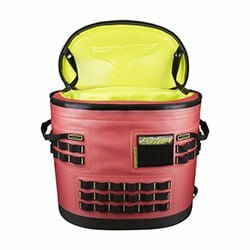 As would be expected of a product from Orca, their backpack cooler has some great features that a savvy user will appreciate. Our favorite feature is the way the lid opens. The Orca has a German TiZip Master seal #6 (Pod) and #10 (Podster), like many other soft-sided coolers of the same caliber. There is just one problem we experience with other coolers: they are so hard to get into. First, the zipper is pretty hard to operate. Ask anyone who’s owned a Yeti Hopper, and they’ll tell you that it takes quite a bit of strength to zip and unzip the thing. But it doesn’t end there. The lid doesn’t open much, either. You have to stick your hand inside to access the contents of the cooler. Now, while we appreciate that a lid that doesn’t open all the way is probably by design so as to protect the internal temperature, it comes at the sacrifice of comfort. It’s hard enough trying to stick a large hand into the small space left by the lid; it’s even harder when the tough zipper keeps grazing against your skin. Orca decided to address this issue with their backpack cooler. The zipper still requires some effort to open, but the lid is capable of opening a full 180 degrees! It has some straps that you can use to limit the opening to 90 degrees or less if you want, too. We feel that was very considerate of them. Another feature we loved was the ability to carry the Orca Pod and Podster like a backpack. Most of the soft coolers we’ve reviewed before are carried around like tote bags. They have side handles if you want to carry them like hard-sided coolers and shoulder straps so you can carry them like a kind of purse. The Orca backpack cooler has all of those features. You can carry it like a purse or like a hard-sided cooler. But you can also carry it like a backpack. We loved how comfortable it was too. The padding on both the straps and the surface that rests on the back makes this thing as comfortable to carry around as a regular hiking bag. TIP: Here are more backpack-style soft coolers that we have reviewed before. There is also Molle webbing sewn around the entire bag to facilitate the carrying of more outdoor accessories, from D-Rings to steel tie downs. 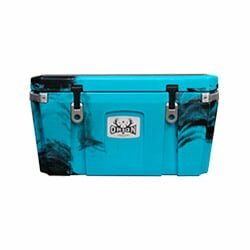 Orca put a lot of thought into the design of this cooler and made a masterpiece. We’re giving it a 5 for the features! We’re also throwing in a solid 5 for the quality! Orca Podstar Cooler in action! The Orca Pod is meant for long hiking trips that require more capacity while the Orca Podster is meant for shorter day trips where capacity doesn’t need to be so high. Their features are otherwise equal. There doesn’t seem to be much variety here, but there doesn’t have to be. The Orca backpack cooler is a pretty specific kind of cooler that appeals to a specific kind of adventurer. The variety they offer in their line of hard coolers reflects this. 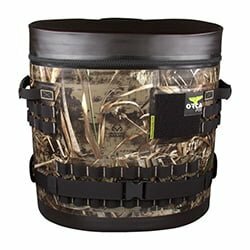 The Orca Podstar backpack coolers come in 4 color combinations: Seafoam/Grey, Coral/Grey, Green/Brown, and Realtree Max 5 camouflage. 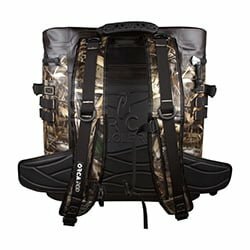 The Pod Backpack comes in Realtree Max 5 camouflage only. Orca stand behind their products, and their backpack cooler is no exception. 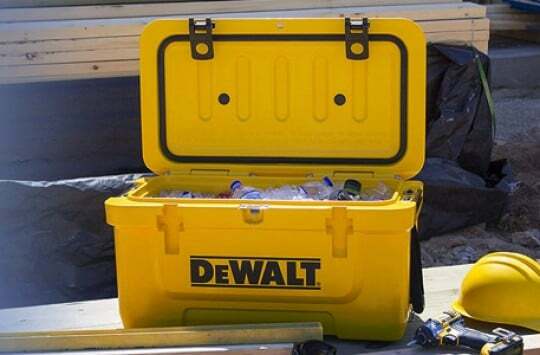 This cooler comes with a full 3-year warranty. 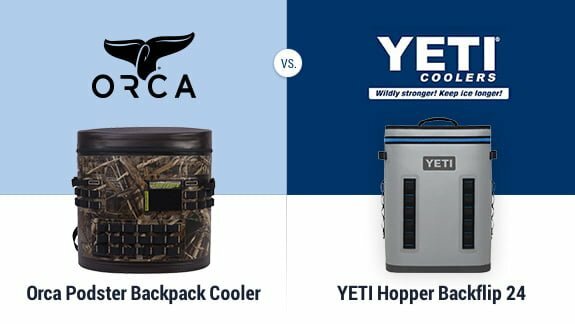 The Yeti Hopper BackFlip and the Orca backpack cooler are both premium coolers from premium brands known for making the best products in the industry. Making a comparison between these two with the aim of finding a winner certainly isn’t easy. They’re both really good! The Yeti Hopper BackFlip is specifically designed to be carried as a backpack. It’s designed to distribute the weight of your goods evenly, making it easy and comfortable for you to carry the backpack for long distances when full. It also has an extra waist belt and chest strap, both removable, for extra stability. The Orca, we’ve already told you about. So the question is, what are the unique points for each? The stability aspect seems to favor the Yeti Hopper BackFblip. The extra chest strap and waist belt are pretty thoughtful features that make it even easier to carry your backpack cooler. The Orca, while also pretty easy to carry, doesn’t have a waist belt. What we like about Orca is a fact, that you can also get an extra shoulder strap for your Pod/Podster cooler and carry it like a regular soft cooler. So in conclusion, we’ll announce a tie for that. As far as variety is concerned, it’s again a tie. They are both special purpose coolers. Orca wins, however, when it comes to the range of colors. Yeti only comes in the fog gray/tahoe blue option. Both coolers are pricey, so not much to say there. In fact, that inspired our rating of 4.5 on price for the Orca, but we still believe it’s worth its price! 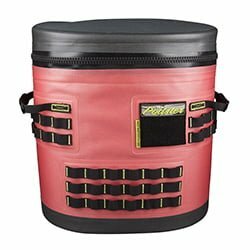 Both backpack coolers are premium and offer a lot of great features. We think it’s a tie. Unless you’re a die-hard fan of either brand, we’d say look at the individual prices and pick whichever gives you more bang for your buck. 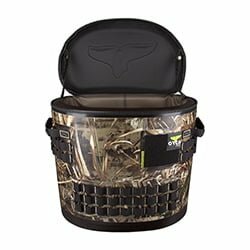 The greatest advantage the RTIC backpack cooler has over the Orca Backpack cooler is capacity. It can carry 40 cans as opposed to the Orca’s maximum of 24 cans (Orca Pod). It’s a slim margin, but it probably counts if you want to carry that extra beer to your camping trip. The RTIC has its own great innovations. It floats, it keeps ice cold for about 2 days, it has a roll top to eliminate cumbersome zipping, and it’s compact enough to be carried around when not in use. Did we mention it floats? And that it’s 100% waterproof? 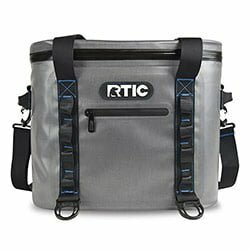 All-round, the RTIC backpack cooler is a great bargain for the price and would be an excellent alternative to the Orca backpack cooler for those on a tighter budget. Read our Rtic’s soft cooler review, or check its price on Amazon here. The Polar Bear H2O Backpack was designed for one thing: to be the most impenetrable soft cooler to water. This backpack cooler can be taken surfing, kayaking, fishing, or even all-out swimming. It is both waterproof and sweatproof and has a bunch of other features. The closed cell insulation is one inch thick and among the best in its class. Other design features like reflective space layering and material blending help the ice retention last even longer. It comes in only two colors: ice blue and charcoal, while the capacity is 18 quarts. 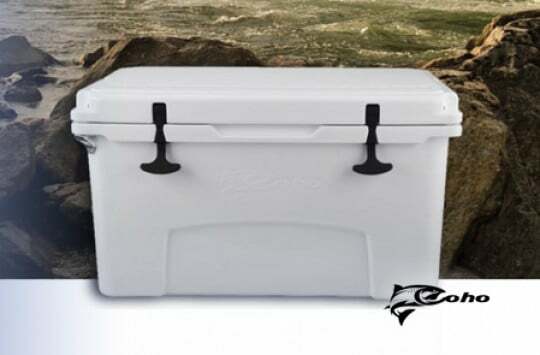 It’s a great cooler that would have been excellent as the midway option between the Orca Pod and the Orca Podster. Here is our in-depth Polar Bear Coolers guide, plus you can also check it on Amazon. If you’re on a budget, go with the RTIC or Polar Bear – whichever your budget permits. However, if you don’t mind the price, we’d advise you to go for a premium brand, such as the Orca. 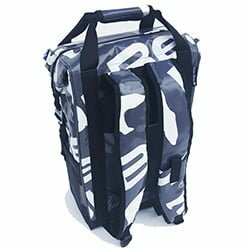 Orca Backpack Coolers for Sale – Where to Buy? 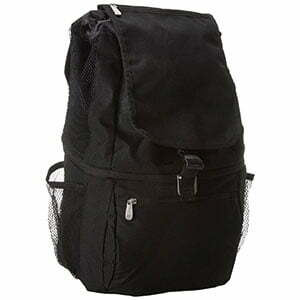 Orca backpack coolers can be bought in a variety of places both online and offline, including their website. However, we recommend buying your backpack cooler from Amazon. Amazon will show you real buyer reviews by others who have tried the product before. You can also get free shipping in some cases, especially if you’re subscribed to Amazon Prime. They also offer buyer protection and refunded returns in case you aren’t satisfied with your purchase. An Orca backpack cooler isn’t just a cooler. It’s pretty much a companion that you can take with you wherever you go. 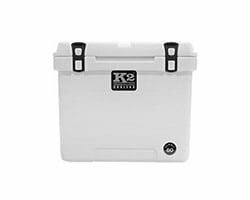 These coolers are built to last and come with features that anticipate all your needs. We fell in love with them, and we hope you do too. Happy adventures! An Orca Backpack Cooler isn’t just a cooler. It’s pretty much a companion that you can take with you wherever you go. 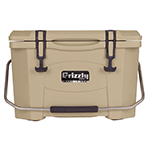 These coolers are built to last and come with features that anticipate all your needs. We fell in love with them, and we hope you do too.